Wikimedia’s contribution campaign for 2010 is a serious endeavor. As Philippe told you yesterday, in a relatively short time period we need to raise the funds that keep Wikipedia and the other Wikimedia projects available for free to everyone. Millions of people use Wikipedia every day. It’s clear that more than a few of our readers have noticed yesterday’s launch. Nearly all of the responses we find are constructive for thinking about how to keep Wikipedia free. Some of them are simply hilarious. Too hilarious not to share, in fact. Here’s our list of the best, or rather the most amusing, tidbits about this year’s fundraiser. We’re glad we’re not the only folks with a healthy sense of humor. We consider this post to be in the tradition of Wikipedia humor, of which a favorite example is Bad Jokes and Other Deleted Nonsense. Thanks to a link from O’Reilly Radar, Information is Beautiful created a rather stunning infographic about our appeals. Not to be outdone, Flowing Data has their own take. The Huffington Post also has a smart rundown on our banner testing strategy, and includes a poll where you can choose which of two banners you prefer. Time.com’s Techland blog declared Jimmy’s expression “Don Draper-esque.” We’re unofficially declaring that a win for Wikipedia’s cool factor. A blogger from Indiana wrote a satire which expresses another strong but nevertheless funny reaction to the banners. New York Magazine’s Daily Intel blog has a short but sweet post that reminds readers of the somewhat surprising list of Wikipedia’s most popular articles. The community at social news site Reddit has several hysterical threads about the campaign, including Photoshop jokes and unfortunate coincidences. The same Reddit posts often have practical advice for how to help us improve the donation system. And a gentleman who apparently feels a little guilty about the size of his donation. Hopefully he knows that our average gift isn’t over $30 USD, as you can see at our public donation statistics page. If you’d like to keep up on similar unofficial news from our contribution campaign, please follow the #keepitfree hashtag on Twitter. For a more official take, follow @Wikipedia and @Wikimedia. Visit donate.wikimedia.org to do your part to sustain the free encyclopedia anyone can edit. “I donated because I couldn’t justify *not* doing so. Wikipedia has been a constant and reliable source of information for me, both for personal entertainment and business purposes. Wikipedia contains the most relevant information on every topic imaginable; content is updated at the speed of current relevance, and errors are quickly eradicated by wary and knowing users. This site has placed the Age of Information into the hands of the common person: People like me. People like you. There is nothing more powerful than an immediately editable knowledge base given to a global body of users. You trust your users to do the right thing. I encourage others to donate. 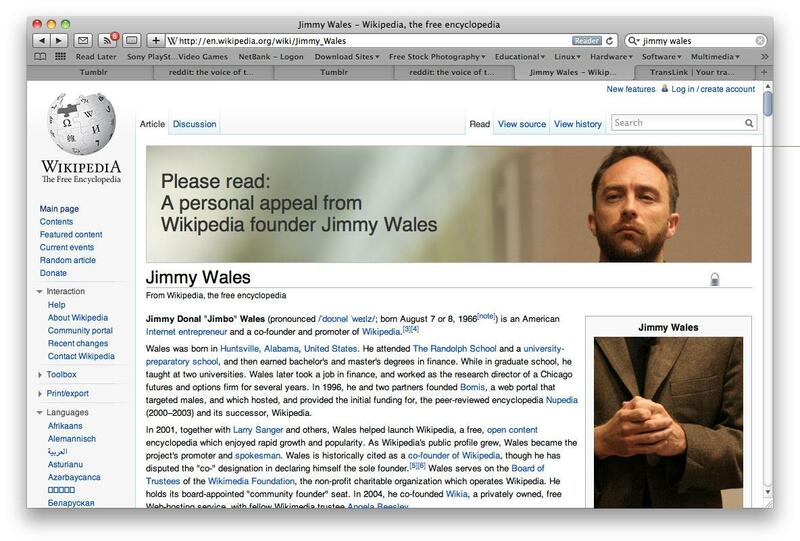 Hi, Steven, have you seen http://techcrunch.com/2010/11/22/just-add-wales/ It’s pretty hillarious :) (it was briefly mentioned in http://thewikipedian.net/2010/11/20/wikipedia-fundraising-banners-and-jimmy-wales/ too) Please say hi to the rest of the gang. Many editors like myself have given up on contributing to articles as time and expertise invested is rapidly eradicated by those with more free time and less expertise in the subject matter. I applaud the idea of paid advertising as it may eventually lead to paid staff that could create, edit or moderate truly encyclopedic articles. Of course bias would exist in a profit based model, but my opinion is that there would be far less bias than that which currently exists. je suis heureux de contribuer avec mes moyens à Wikipédia…($10.00) Wikimédia vs wikipedia??? File backups shouldn’t have to be a task. A thoughtful backup cron will go for ages. I have been using wikipedia for any info that I M looking for, however, someone here mentioned that the accuracy of it can be questioned!! I am worried about it. A viral-humor take from the-definition.com to help the wiki cause! We use wikipedia every single day in our house. It’s a great source of info that’s why we support it and have donated! It has been a great idea from the start and it is now a unique reference point for anything that comes to mind. This post Wikimedia blog » Blog Archive » Bad Jokes and Other Deleted Nonsense hit the nail on the head. I’ll be guaranteed to come back here often to find out what you have to say. You gained a viewer. As for donations, I would not donate anything to this or anyother self-serving cause that does not help innocent children in the USA to have safe shelter, nutrious food, and warm clothing. Having just recently completed and MBA in the United States (March/2010), I found it very strange that more than 98% of all Colleges, Universities and Public Institutions of Educaition will fail a student for using Wikipedia. In respect of the attempt to provide free access to information on the world wide web, and knowing the foundation utilizes grants it should take the time to validate, and ensure that all information is accurate,properly cited, and to conisider hiring a team to review any article or publiction prior to publishing or be fined for enabling plagerism and other acts that distort and abuse propeitary information, that may be false or inaccurate. 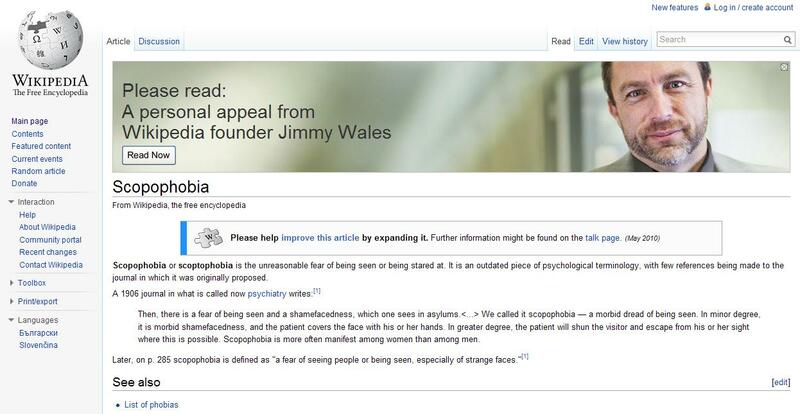 I like your foto above Plato ,Jimmy LOL…!Donated anyway.